After years of preparation, the City of Portland Home Energy Score policy has now been in effect for a couple weeks. 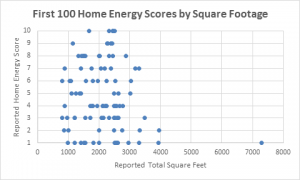 As of the morning of January 15th, there were exactly 100 homes listed or pending on the RMLS with Home Energy Scores. Here are some interesting statistics about those homes. 1. 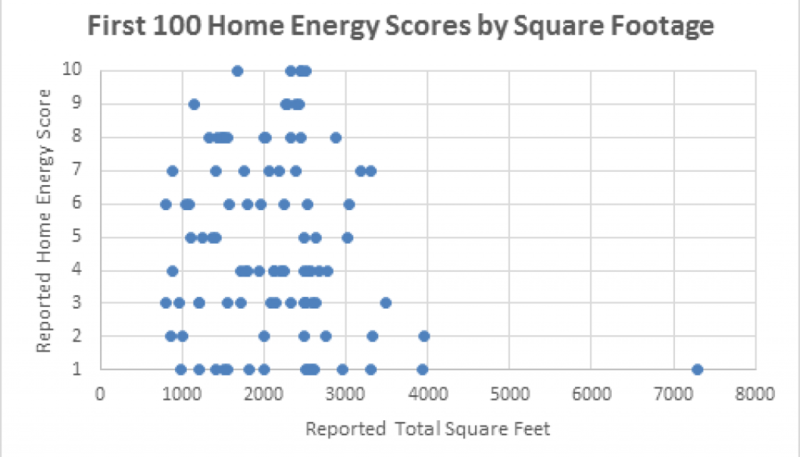 Right now, the average City of Portland Home Energy Score is slightly below the national average at 4.67 with this data set having a similar average size of 2,120 square feet compared to the national average. When checked one week ago, the average was 3.7. In general, we are noticing that Portland homes tend to score below five. In other words, homes in Portland are estimated to use more energy than 50% of U.S. homes when placed in Portland’s weather. Also, a score of one is four times as common as a score of ten. 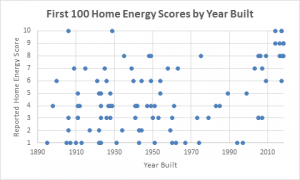 A possible reason for this may be that Portland has a mild climate in comparison to other parts of the country and consequently, homes here have not been upgraded as much for energy efficiency in retrofitting or baseline code. Here is a link to a video clip starting with me explaining the one to ten rating. a. Homes around 1,000 square feet do not tend to score any better than homes twice their size. b. Homes smaller than 2,500 square feet tend to run the range of scores with no average decline in score until about 2,500 square feet. c. Homes over 4,000 square feet tend to score only at the very lowest end of the range; usually a one or maybe a two if the home is not much over 4,000 square feet. It is common for a home over 4,000 square feet to show “Score Today” one and “Score with Improvements” (on the back of the report) to also be a one. This means that even after making the recommended improvements, the home will still score a one. a. Homes built after 2010 are more than twice as likely to score a nine or ten and are most likely to score above average, unless they are large. However, it is my observation that the homes with a score of nine or ten tend to be built specifically for high performance and do not have air conditioning. b. Homes built prior to 2005 are no more likely to score above average than homes built in the early 1900s. 4. Out of these 100 homes studied, surprisingly none are attached homes. Of the attached homes we have scored in our office, all have scored higher than we expected. This is likely because attached homes typically have fewer windows and exposed exterior walls where heat loss tends to occur. If you find this information interesting or useful, please follow us on Facebook for occasional blog posts or special offers. If you need Portland, Oregon area home measurements or City of Portland Home Energy Scores, schedule today or contact us with any question. We will do everything possible to assist you. Did you know, Gary Kristensen is an Approved Trainer with the City of Portland Home Energy Score program, can speak at your real estate office, and can offer a unique prospective as both an expert on appraising energy efficient homes and a certified home energy assessor.